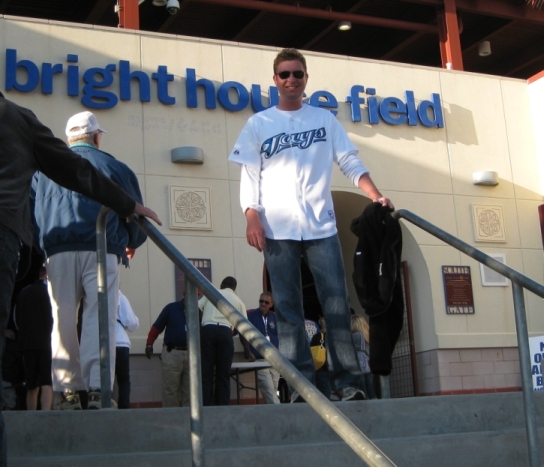 Following the day’s shenanigans at the Bobby Mattick Complex, I went to an Orioles/Phillies game at the spring training home of the Phillies – Bright House Field. 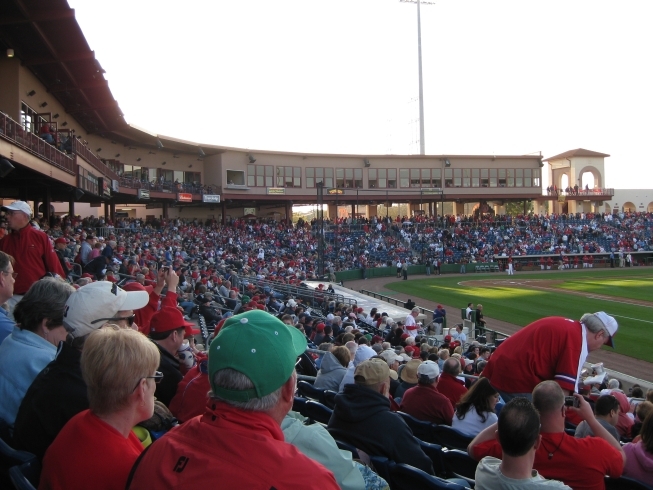 Built in 2004, Bright House Field is also the palatial home to the Phillies’ minor league affiliate, the Clearwater Threshers. 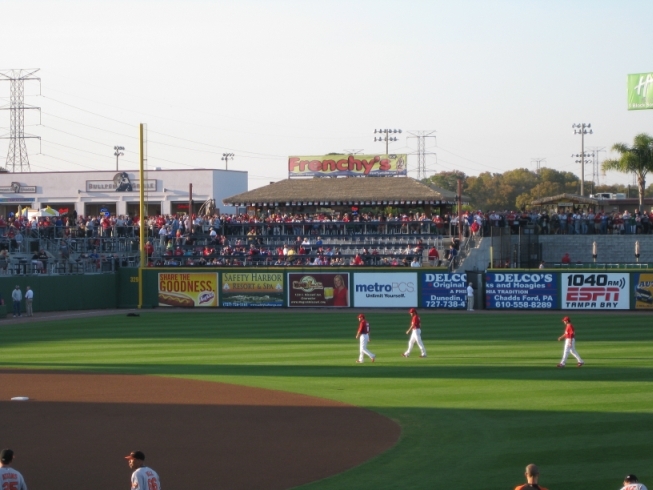 The ballpark has 7,000 seats with an additional 1,500 spaces available on the “berm” (the grassy hill beyond centre field). That doesn’t take into account standing room only around the stadium. On this night I would guess there were between 9,000 and 10,000 fans. Being at the ballpark kind of felt like I was watching a baseball game in a resort. There is a distinct Spanish architectural influence with contrasting colours, brick accents, tiled roofs and an adobe-like finish to the walls. The lighting is also very aesthetically pleasing. You can take the Jay out of Toronto but you can never take the Toronto out of the Jay.. what? 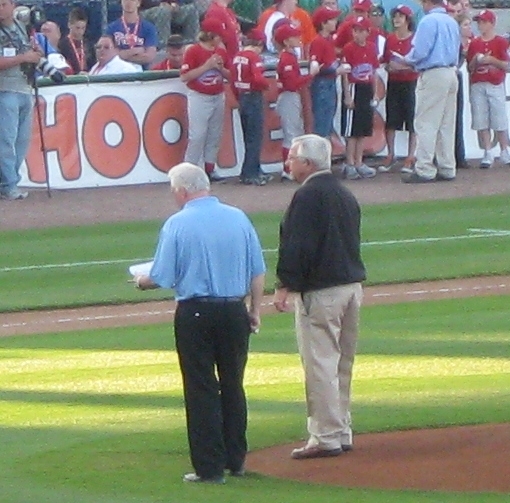 On this night former Jays coach Galen Cisco threw out the ceremonial first pitch. What I didn’t know was that he was a two-sport star and was team captain of the 1957 Ohio State Buckeys football team. 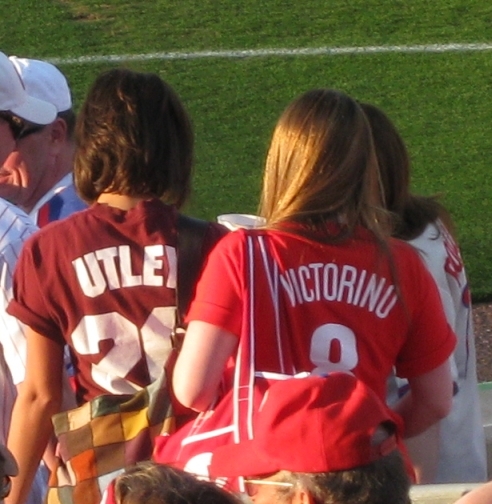 Why then was he at this Phillies game? 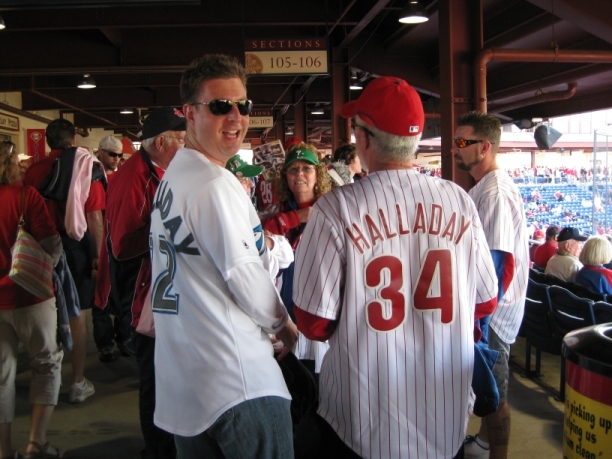 Following his stint as coach with Toronto, he joined the Phillies as their pitching coach and helped Randy Wolf and Paul Byrd achieve success. What was also surprising – well maybe not so much surprising as different – was the number of female fans. 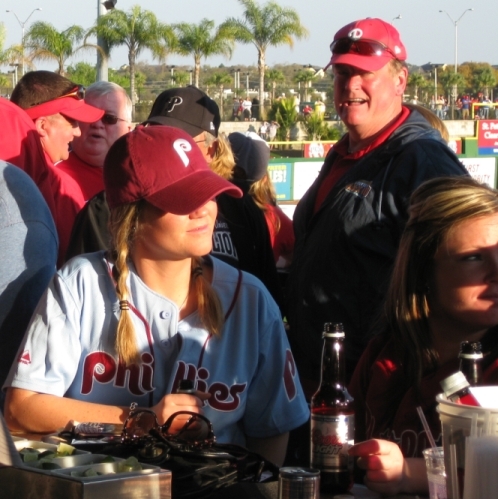 It has quickly become apparent to me that American Girls love their baseball. I’m not saying that Canadian Girls don’t, because I know they do and I know many of them – but the sheer number of rabid female baseball fans exceeds that of Canada exponentially. 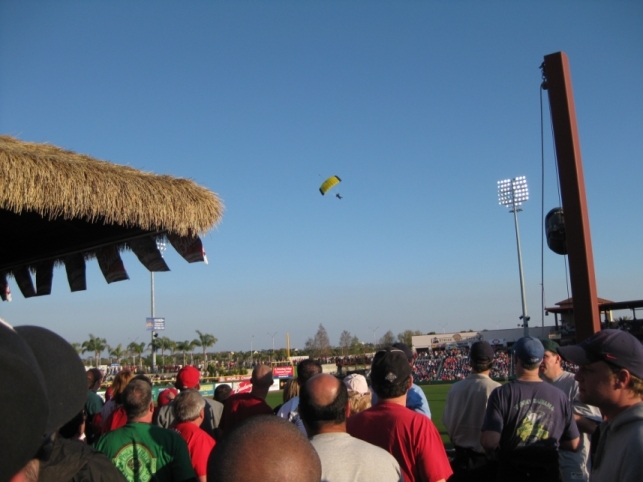 Before the game there were skydivers landing on the infield. Kind of cool. As well, little league kids got to go field their positions with the big boys. 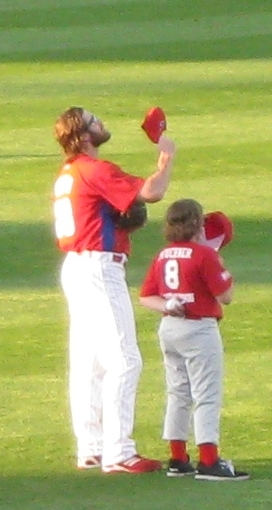 Jason Werth ended up with his own mini-me. The actual game itself was pretty special. Hot prospect Brian Matusz got the start for Baltimore and no-hit the regular season Phillies lineup through 5.1IP. He was pulled because of his pitch count. Then it was a no-hit by committee until John Mayberry broke up the no-hit bid in the 8th. Matusz struck out 6 and retired the first three Phillies hitters on only 8 pitches. He was basically putting on a clinic, getting groundballs all day, executing pitches, disrupting timing and just being an all around stud. 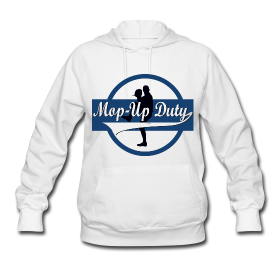 Watch out for Matusz, he is going to be a star. Kyle Kendrick got the start for Philadelphia and he was mediocre at best. No Matt Wieters sightings today, or Dominic Moore for that matter. 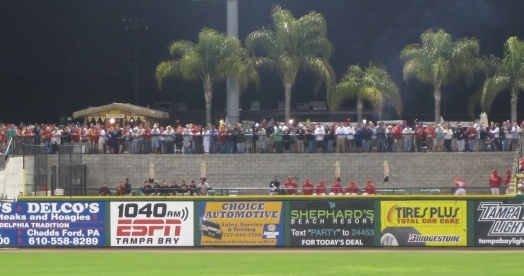 Oh one other thing.. a neat aspect about the park is that the bullpen is right below the Tiki Bar Pavillion’s standing room only seating. This allows for a good drunken bullpen heckle later on in the game. That’s about it as far as Bright House Field goes. 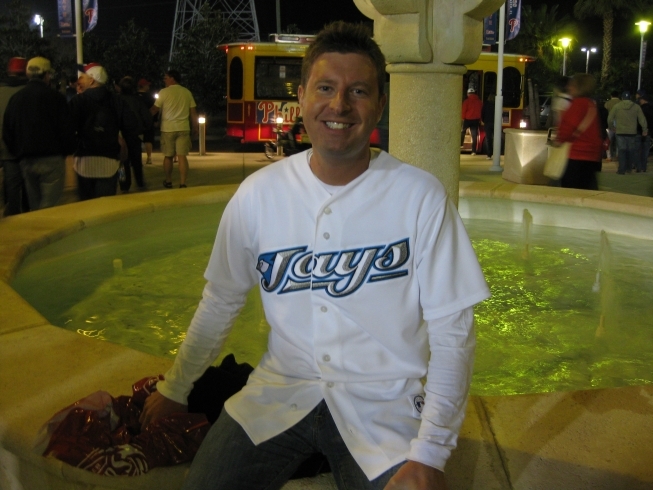 I am back to Dunedin Stadium today to see the Jays take on the Braves. Can’t wait! Love up the Tiki Bar. Great stuff with this collection of Dunedin posts. Some of the best reporting that’s come out of the Toronto blogosphere. This ballpark look so awesome! Great post, and great pics.